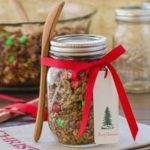 A recipe for homemade crunchy granola made with oats, coconut, wheat germ, nuts, dried fruits, and chocolate covered candies. Arrange oven racks to upper and lower thirds of the oven. Preheat oven to 275 degrees F. Lightly grease two 13- X 18- X 1-inch baking sheets. Add coconut oil, 1/2 cup chocolates, and water to a small saucepan or skillet over medium-low heat. Cook, stirring occasionally, until coconut oil and chocolates are melted. Remove from heat and add vanilla. Combine oats, coconut, wheat germ, brown sugar, fruit, pecans, walnuts and salt in a large bowl. Pour melted chocolate mixture over dry ingredients. Stir to combine (will look slightly moistened). Divide mixture in half and spread evenly on baking sheets. Bake for 60 minutes (1 hour), stirring mixture and rotating pans every 20 minutes during baking. Cool granola completely in the pans. Once cooled, stir in remaining 2 cups chocolates. Store in an airtight container.